Art Services, Ink. provides Custom Framing Solutions, Art selection, Printing and Installations for Residential, Corporate, and Interior Planners throughout Central Florida & beyond. Owner, Mike Finnimore, graduated from Savannah College Art and Design with a B.A. in Fine Arts and has been a successful artist since 1990. He saw the need for creative and quality framing services without the high costs to achieve a piece of finished art. Mike has supported the local arts, artists, and their charities since opening his business. In our 10 year history, we have worked with hundreds of clients, completing as few as one distinctive piece for a home to more than 200 pieces for a large commercial property. 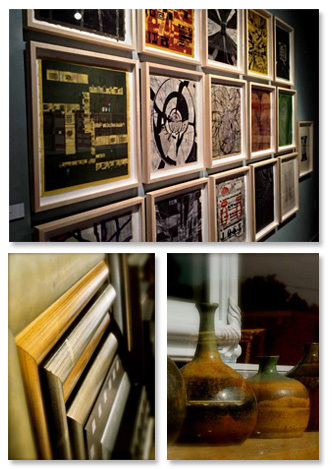 Our design consultants create innovative art and framing solutions based on your unique needs. We can handle all aspects of the process from selection & acquisition to manufacturing and installation. Our goal is to provide outstanding service, tasteful design, and superb craftsmanship at a reasonable and fair cost. Our design consultants can guide you through our extensive choices in frame mouldings, mats and more for endless framing designs. There's truly something for every style and every budget. When it comes to finding the right artwork, we bring you vast choices of prints, limited editions, print-on-demand and original artwork. In addition to a catalog of over 3,000,000 images, we can facilitate printing of your own images on a wide range of papers, canvas and other substrates... custom-sized to fit your design vision. For our commercial clients - See what a difference art & framing makes in your work space. It's one of the most affordable ways to enhance your company's image. Your company's image and environment are important to your customers, clients and employees. Your interior space is a reflection of your success. Framed artwork, awards, mirrors and more provide the finishing touches to an office interior.